Dude. 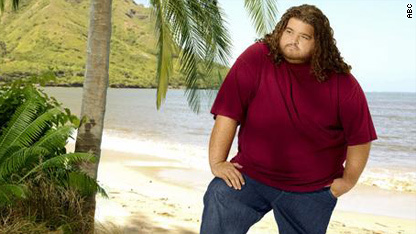 For a character who just appeared to be comic relief early on, Hugo "Hurley" Reyes (Jorge Garcia) has been a crucial part of "Lost" throughout its six-season run, as the "voice of the fans," and particularly in this season, taking on something of a leadership role. When you think about it, Hurley has really been the linchpin that has held the show together. The guy who considered himself cursed after winning the lottery (thanks to those ever-present "numbers" - more on that in a moment) considers himself the luckiest man alive, in the "flash-sideways" timeline. It looks like we'll find out more about that in tonight's new episode. Last week, we caught up with Desmond, who has been a key character to "Lost's" mysteries since the second season, but in his own way, Hurley has been connected to many of the major plot points of the show. There are the aforementioned numbers, which we now know correspond to "candidates" to replace Jacob, one of which is Hurley himself. Whether or not we'll learn any more about whether those numbers are indeed "cursed" remains to be seen. In both realities, Hugo owned a box company with his lottery winnings, a company which employed John Locke, one of the most important characters on the show. On the island, he met Ethan, and his decision to conduct a census led to the castaways' first discovery of the Others. He also fell in love with Libby, who helped Desmond get to the island, and whose death (along with Ana Lucia) at the hands of Michael was a turning point in the series. Hurley's ability to see the dead (not related, it appears to be "Smokey's" ability to take on their form – or is it?) came into focus last season, as various dead castaways visited him off the island. Hurley's importance really came into focus as he was visited by the still-living Jacob and specifically told to go back to the island with his scroll (in the most needlessly-elaborate possible way, but that's a discussion for another day). Then after Jacob died, Hurley became his messenger and took charge for a time while Jack, Sawyer and others seemed more confused than anything else by the events following "the incident." The best part of Hurley's personality has been his willingness to ask the obvious questions most fans would ask. The most memorable example of this would be in the second season, when he started to become convinced that the island was just his dream, in a tour de force episode which explained why that once-popular theory was not the case. More recently, I was overjoyed to see that Hurley voiced the well-known fan theory that the skeletons in the cave are two of the castaways. And I was even more pleased to see him finally be the one to ask Richard why he never ages (at long last)! Finally, if there's one big "Lost" mystery which I hope will be explained, it's this one: what was the deal with that bird that said Hurley's name at the end of season two? Seriously, I gotta know. It's clear that Hurley is important, and this week's episode should give us a better idea as to what his role will be in the big series finale. Meanwhile, Geek Out! and CNN iReport want your ideas for how "Lost" should end. Share your video telling us what should happen on the series finale (but keep it short, 30 seconds or less)! In the meantime, Do you share my appreciation for Hurley? If so, share your favorite Hurley moment in the comments below (and if not, who is your favorite “Lost” character and why)? I really like the character of Hurley. My appreciation for him was cemented when he created the golf course with the reasoning of "we might as well have fun while we're here". I couldn't have said it better myself. Not sure how the finale will play out, but I do think we'll only get half of our answers and the rest will be left up to the individual to figure out by inserting their own beliefs about life, death and the in-between. Hurley brings the show back down to Earth when it gets too serious, that's what I love about him. The episode with the Van and "Roger Workman" (Ben's dad!!) was by far, my favorite episode. But you leave out one of the big fan questions about Hurley ... "How can you spend that much time on a deserted island with little food and NOT LOSE WEIGHT?" 6 years on a desert island? Hows he still fat? Throwing the hotpocket at Ben. Hilarious. Sawyer has always been my favorite character on LOST. He's sarcastic in the most entertaining way, and, he's not too back to look at either. Actually, Hurley is even fatter now than he was when the plane crashed (or didn't crash). The show's been on for six years, but Hurley and the other castaways were only on the island for something like 101 days. No, it really was 100 days on the island, not 108 (September 22 – December 30, 2004). See the timeline posted at http://lostpedia.wikia.com/wiki/Timeline ... You can track the days by following the dialogue very, very carefully. The show should end like this: The creators should get on camera and apologize for what has turned into a desparate attempt to make sense of something they never thought out. They continue to pull plot twists out of their backsides because they really never had this fully worked out. The ending will be disappointing unless you're just one of the fanboys who loves trying to figure out meaningless drivel. Actually, the show will end like this: Russell is still stuck on the island typing out internet messages on his coconut computer. I only hope that Lost doesn't end in the same dissatisfying manner that Twin Peaks ended... 20 years later and I am still disappointed. Here is teh last scene in LOST: Hurley is sitting on the beach. Locke/Smokey walks over and sits beside him. They look out at the ocean and a ship come sinto view. Locke/Smokey walks off. Hurley is the new Jacob. Scene fades out. At least "Lost," and heck even "Twin Peaks," had an ending...I still hold a grudge that the ABC's "Invasion" ended with an unresolved cliffhanger. Stupid ABC. Love Hurley. Friend to everyone and can always find food somewhere. I would love to see success for him in the end and confidence that he is not a bad omen. In the alternate life, I think they'll all meet up at the hospital. They're all headed there. I love Hurley because he is one of the few characters on the island without an agenda. What you see is what you get–a decent individual who so often cuts through the nonsense and asks the obvious questions. We took a vote in our house and agree unanimously that Hurley is the only one who "deserves" to be the next Jacob. Is that show still on? Charles...they DID build a raft and it didn't work out. Also, pretty much the entire show has been about the folks trying to get off the island. Clearly you don't watch so please refrain from making comments on something you know nothing about. I gave up on LOST a couple years ago, and these recaps make me glad. They are just making stuff up now. The bird who said 'Hurley?' Throwaway – it will never be explained. Three-toed statues? Why the smoke monster ate the pilot? Throwaways. Why is a raven like a writing desk? Throwaways. Obviously the whole thing is a dream, because there aren't time-traveling islands and magic numbers in the real world, and now it's just a big bore. They tell me Ben is the hero now and Jack the villain, and I have to think back to recall which was which. bubba the three toed statue was explained this season. it ties in with the "black rock" slave ship thing they found, which was explained as well. to say ben is the hero and jack is the villain isn't exactly wrong, but it's not exactly right either. with the recent revelations of whidmore, ben is securely in the villian role again. jack isn't the do gooder he was in the first season or 2, but he's more torn and deeper in unanswered questions than ever before too... seems to be focused now. why the smoke monster ate the pilot, well, it explains the smoke monster and what it is, in a round about way.. it doesn't explain WHAT it is (or that weird roller coaster noise it makes), but it explains it's purpose and origin. i agree the show has strayed very far.. sometime around season 3, the whole plot took a hard left into highly theoretical stuff that would be enticing to people who ponder time/space and it's interaction with cause/effect, but is really hard to maked interesting..
"Dude, you've got some ... Arzt on you..."
One of my favorite Hurley moments was getting that blue VW to start and flying down the hill in it with the "Road to Shambala" playing - a great, happy, free spirit moment. I am glad to see a show with a "fluffy" latino guy. Lost would probably be very disturbing without the comic relief of his character. Hurley is the most decent of all of the characters. He has no hidden agenda, is always trying to do the right thing, and always thinks of everyone else first. All of the other characters have some type of a big flaw in their personality. I just hope it doesn't end with all the characters sitting in a diner with Journey's "Don't Stop Believing" playing in the background, and then the screen goes black. So what's up with Desmond running Locke over? Does he want to kill him because he knows that Locke'll end up being Smoke monster? Or does he just want to bring him close to death so that he "remembers" the island? Any comments? For fans of Hurley, check out "Dispatches from the Island"... Jorge Garcia's blog. He is super funny and often throws in little tidbits about the show. Hurley understands the island better than anybody than perhaps the real Locke did. I think he's an excellent candidate to be the new Jacob. There are six left. I can't name all of them because I don't remember whose names were scratched out. Jack was my choice after the episode with the lighthouse. Jacob was a very complicated figure and Hurley's strengths are his simplicity and consistency. Can he fill the role of Jacob and do what needs to be done? He was too laid-back I thought. Content to follow. But, he learned what it takes to be a leader in this episode: how to make decisions that others will follow and take responsibility when he is not certain, but just doing his best. It's terrifying and requires a special kind of courage. Some like Jack relish the role and seem made for it, until you see that they just need control. Hurley doesn't need or want to be a leader, but he can do it if he has to. That is the mark of great AND benevolent leadership. That is an important character development. It was the only thing he ever lacked. !! !secret ending!!! !I know the ending it will be a piture of a red robot and it will say "bad robot" then the ABC symbol. You heard it here first folks. I am guessing that LOST will end as it started or some variation of that with the characters taking on other positions of authority as everyone keeps saying. The REAL question everyone should be asking is "Why is he still obese after 6 seasons?" Did he find a chocolate bar tree that no one else knows about? Come on!!! After 6 years on the island he is still huge! Jacob and Smokey don't represent good and evil, everyone. People need to get passed this. They represent ying and yang. My bet is that Jacob becomes Obama and Smokey becomes Bush. The polar opposites quarrel for the next millennium on the island and then Rose comes outta nowhere and slaps them both in the face, points a hard finger at the both of them and says, "You better shape up or ship out – both of you! I don't need any of this carryin' on and the people watching think you're both morons!" I think Desmond hit Locke because Desmond knows that near-death experiences make people "remember" the main timeline. I can think of a hundred more controlled and kinder ways to do that, but apparently Locke did survive. Can we start with some fat jokes? I quickly perused but didn't read every comment, so apologies if I'm repeating something already mentioned. I don't think Desmond was trying to kill Locke but trigger a near death experience so Locke can 'remember' he was on the island. Desmond's mission is to get each person to trigger an emotion so they can remember the island. For Hurley, his emotion is the love of Libby and the kiss triggered his memory. Charlie purposely forced the car wreck to trigger Desmond's emotions to allow him to remember. I assume Sun's memories will come to her due to being shot. Jack, not sure what they'll do to him unless it has to due with Locke when they take him to the hospital. I used to get into the theories but now just sit back and watch. Hurley is the man. A couple of things. Locke was hit by desmond so he will go to the Hospital so Jack can work on him. They are each others "constant" (they are the Ying and Yang, always have been). Kate and Sawyer are already together (though it has taken forever since he caught her), and this will set off them remembering. In the end, it has to be Jack (as Jacob) and Locke (as MIB), as they have always been the Ying and Yang (always fighting for leadership). Interestingly, Locke would have fit better as Jacob (he is more of the Destiny guy), where as Jack has always been more of the scientific, don't trust anyone person (much more like MIB). Somehow, i believe the young biy who seems to be getting older every time Flocke sees him (and gets Flocke angry every time he sees him) looks a LOT like a young Jacob, so maybe Jack is the new Richard, and this kid wandering around is really Jacob coming back. Either way, I will watch to the end. Hurley has always been my favorite character. The innocence and naivity of his character is so charming. I think Hurley should be the keeper of the island. Hurley and Sayid make the show. The others are, for the most part, individually, predictably dull. I think Hurley is taking the leader role now because he actually likes his alternate life (no course, millionaire, Libby), so he might be trying to protect it by not letting the other castaways destroy the Ajira plane. From the people who remember the island in the alternate life, he and Desmond are the only ones alive in the real timeline. He, as Desmond is, is councious already in the real timeline about the alternate ife. Hurley is still the same size after 6 yrs on the show because it is only supposed to be like 90 ish days on the island, no matter how many seasons we have watched the show. Hurley wont be the new Jaocb. It is obviously Jack. Reasons: he has a new slicked to the side hair do, he is now a man of faith, they was the scene in the light house episode where Jack is sitting on the rocks staring out into the ocean (very Jacob-esk) and Jacob says, "with some people they need to figure it out on there own" (or something like that). It wont be Kate, she was crossed off the list, maybe this mean her fate is death? Hurley seems more of a pawn, like he can see dead people, thus Jacob, and can help Jacob out, this is his destiny and reason for being on the island. One of the keys is fear, or the lack of it. Sawyer knew IMMEDIATELY that FLocke was not the real John Locke. He said it was because the real Locke was always afraid, and FLocke wasn't afraid at all. Before FLocke threw Desmond down the well, he asked him why he wasn't afraid. Apparently, FLocke requires an environment of fear to thrive, and the totally unafraid Desmond was a threat to that. I got past the whole weight/size issue long ago, as the Hurley character evolved into a perceptive as well as impulsive person. Jacob saw something in Hurley, enough to trust him with the scrolls & the lighthouse. What any person looks like, in this day & age, should have nothing to do with anything, as long as the person (even in a ficticious setting such as Lost) is kind, productive, and happy. Hi there! You some form of pro? Great message. Can you inform me learn how to subscribe your weblog?